We frequently help clients enhance their trade show and expo experiences through graphic design, promotion strategy, and overall consulting. 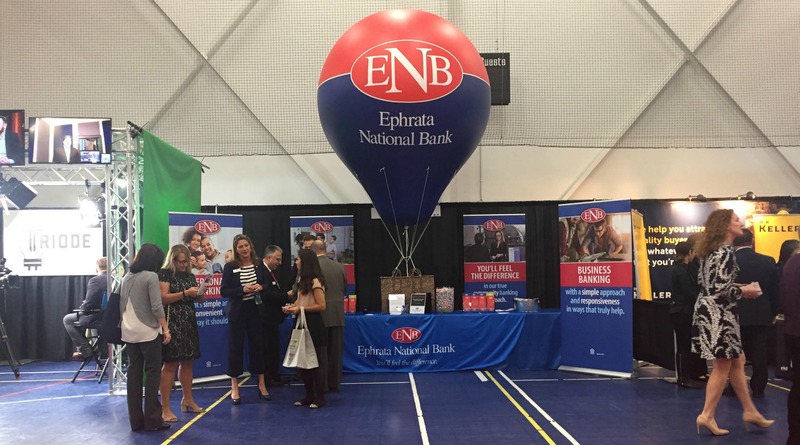 Over the past few years, I’ve had the opportunity to present at the Lancaster Chamber’s Business Expo Booth Camp to help prepare new exhibitors. Here are tips I shared with them to help them make the most of their expo investment. There’s a difference between a trade show and an expo. Keep in mind that “selling” will very likely not occur at an expo. Rather, think of it as a “Brand Show & Tell” where you present your products and services. Start by assembling the right people at your business to talk strategy. What marketing things are sticking that could be used here? What sales tactics are engaging people, and turning leads into quotes or sales? What’s the biggest thing that would help your business right now? Put some of these into practice at your exhibit. Unless you just developed your booth and graphics this year, set it up and analyze it. Is its message still relevant and connected to your current marketing? Is everything still accurate? Is anything missing? What’s your company’s “hook”? What one thing will get someone at this event to stop and say “hmmm”? What’s your differentiator – your unique selling proposition – that will separate your business from others in prospects’ minds? Build that message around your VALUE to customers … not a string of features about your business that others offer as well. Remember that people are easily distracted at shows and expos: lots of people, lots of visual and audio stimulation, and constant interruptions. Think about how you can leave a lasting impression on someone in a brief moment. It’s like speed dating. “Give people a drink from a water fountain, not a fire hose.” Don’t verbally attack people approaching your booth – start by getting them to talk, and then listen. Remember to start with your hook and share your differentiator. Know the show’s audience, and know what competitors will be exhibiting. Craft your VALUE PROPOSITION based on those two factors. The decision-maker for your product or service may not be there. Your strategy is to find out WHO the decision-maker is and how the person in front of you can open the door for you. Find out whom you need to displace. That becomes your follow-up strategy. Know who’s exhibiting on either side of you. Decide who’s going to man your booth. Why are they being asked? They need to be engaging with people and knowledgeable of your products and services. Decide up front how you are going to tag-team. Tape off an area that’s the same dimension as your booth space somewhere at work and begin to organize your booth space. Your booth space and messaging should be inviting … engaging … informative … compelling … memorable. If it’s not inviting, people will keep walking and you’ll miss an opportunity. Does it steal their attention while they’re in front of other booths? How powerfully is your brand presented? Make sure your name/logo are large at the top … well above eye-level so it’s seen at a distance down the aisle. Are you trying to say too much? Avoid information overload. Your booth graphics should just be a billboard. Don’t give away consumables (food) because your brand disappears quickly and is likely forgotten. Is it free junk that people stick in some desk or cabinet drawer … or free usable things? What do people use every day or often? Keep the inexpensive stuff out and the valuable stuff hidden. Be selective to whom you give the good stuff. If you can, select a giveaway that has a connection to your business or brand. Fun and relaxing is great! What are you imprinting on the giveaways? It should be your brand, but not too busy. When your brand won’t fit, a web address is good. Bottom line: Keep the candy at home or the office. Give away an everyday item … or an incentive to buy. Have the right message that supports your brand. Remember, that expos help you open doors. You close sales with your follow-up. How many people did you meet (and shared names or cards) for the first time? How many people became aware (for the first time) of your brand? What does your note tablet look like at the end of the day? (Yes, you should be writing notes throughout the day because you won’t remember those conversation nuggets a few days later.) How many existing customers did you see, greet, and thank for their business? Success should be measured in weeks – maybe months – after the show. Your strategy should be to build brand awareness and fill pages with notes. Then, make sure you follow up on those notes you took. Trade shows and expos are an opportunity to make a big impact with your target audience. Don’t squander that opportunity with a less than impressive booth space or no strategy for moving people into and through the sales funnel. Let us help. Call Scheffey or email us to get a conversation started.